Bob Jacobson’s father was born in Finland, but his son was given a typically Anglo-Saxon name and grew up to embrace the national game of his family’s adopted land. In 1903, at just 18 years of age, Jacobson travelled from his home in Maryborough in central Victoria to play eight games of VFL football for the Carlton Football Club, under the autocratic coaching of Jack Worrall. 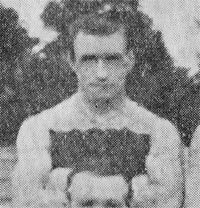 Jacobson made his debut for the Blues on a half-forward flank against Collingwood at Princes Park in round 1, 1903. While Carlton ran out comfortable winners, Bob didn’t make it onto the score sheet that afternoon, or in the following weeks when the Blues destroyed Essendon and St Kilda by 21 and 78 points respectively. Worrall banished Jacobson to the back pocket after that, and he managed only six more appearances before he was given his marching orders after another big victory over Essendon in round 10. At least Jacobson went out on a high – that defeat of the Same Old was built on a superb defensive effort that kept Essendon scoreless for the first half, and eventually restricted them to 2.2 (14) for the whole match. More than 105 years later, that miserable return still stands as Essendon’s lowest-ever score against the Blues. In the years after departing from Princes Park, Jacobson married and took up work as a clerk. When World War 1 began in 1914, it appears that he was deemed to be in a reserved occupation – one that was vital to keeping civil order – and so was prevented from enlisting for active service. But as casualties mounted and more and more men were needed, regulations steadily relaxed, and in December 1917, Bob was finally accepted into uniform. He marched into Broadmeadows army camp a week or so before Christmas, only to almost immediately fall seriously ill. Sent to hospital, he was assessed as unfit for further duty, and discharged in January, 1918. Bob returned to civilian life, and passed away in June 1949, aged 64. "Carlton footballers will be interested to hear that R. Jacobson, who played with the club last year, has been elected captain for the newly formed club in Christchurch, New Zealand. By a singular coincidence, the name of Jacobson's new combination, which plays under Australian Rules, is the Carlton Club - so called after a suburb of Christchurch. Mr. R. McAllum, formerly of Ballarat is vice captain and secretary." Contributors to this page: blueycarlton , molsey , Bombasheldon , PatsFitztrick , tmd1 , Jarusa , WillowBlue , thehalford and admin . Page last modified on Monday 11 of February, 2019 10:44:47 AEDT by blueycarlton.